A veteran songwriter, solo performer, band leader, producer, and session guitarist, Jim Vick has received numerous arts and performance awards for his work in the U.S. and has shared the stage with many much bigger names in the music world. And though you may have already heard his music featured on the soundtrack of Taste the Islands, the Lifetime Network and American Public Television syndicated cooking show, or any of a number of independent and promotional films and other media works, you probably don't know him by name. Unless, of course, you've caught a live performance or stumbled across one of his independently released albums sometime in the past 35 years or so. For over a decade now, Jim has continued performing regularly, but almost exclusively, on the south Caribbean coast of Costa Rica in the little surf and ecotourism town of Puerto Viejo, Limon that has become his home. His multi-instrument one-man-jam-band shows, duo sets with former Skatalites jazz and reggae keyboardist Cameron Greenlee and acoustic trio shows are featured at some of the area's finest performance venues during the winter-spring high tourism season, including La Costa de Papito in Cocles Beach - now 10 years running - and the Lazy Mon and Hot Rocks in downtown Puerto Viejo. Still at work on the forthcoming and long in progress BHAKTI BLUE, an album of new songs based on the Sufi poetry of Rumi, Jim's most recent release, PUNTA RASTA, combines the reggae and calypso sounds of the Caribbean with bluesy guitar, Latin jazz, Afropop, and even a bit of Celtic American folk in a musical "rondon" stew that one fan calls "Latin Americana." It's now available on disc and for downloading here and at most major online distributors, including iTunes, Bandcamp, and Amazon, and for streaming on Apple Music, Spotify, and Amazon Prime. 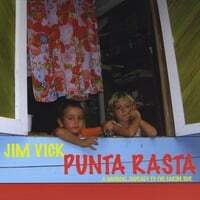 Sign up for Jim's email updates above and you'll get links to free downloads of some of his newest tracks, including "That Caribbean Groove", his good times tribute to his new hometown you'll hear in the video above, as well as private links to live performance videos and exclusive previews of his works in progress.